It’s been many miles of riding. I’m sure you’re all sick of reading about cycling and ready for me to talk about some wine. Well, you’re in luck, as I spent the last two days in the town of Walla Walla and its surrounding wine country. Wednesday was spent in downtown Walla Walla. It’s a cool little downtown, pleasant if a bit touristy, but that’s ok. 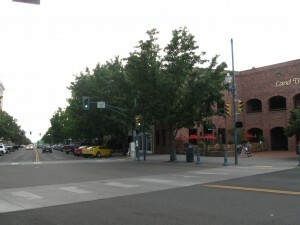 The downtown area is filled mostly with restaurants and, of course, wine tasting rooms for many of the 130 wineries in the Walla Walla area. I hit many places, but I’m just going to tell you about a few of my favorites, to keep things somewhat brief. My first stop ended up being one of my favorites — Sapolil Cellars. Only a few of the wines were still in stock: a couple of syrahs and a chardonnay. But while the selection was limited, at least it was quite tasty. The chard was my kind of chard. It was crisp, minerally, with a nice hint of peach. Most importantly, there was no oak and no buttery flavors to it. The two syrahs were a 2006 and a 2007 from the same vineyard (Patina Vineyard). The ’06 was big, bold and rich, while the ’07 was a little softer. Both were quite tasty and had a nice balance of earth and fruit. Hanging out in the Sapolil tasting room, I had a chance to chat for a while with Bill, the owner and winemaker. First off, he was really awesome in helping me to find a place to crash in Walla Walla that evening. But the conversation covered many different subjects including his philosophy on winemaking, and the joys he’s had bringing live music into his tasting room (a jazz trio goes really well with wine). He’s got a good laidback philosophy on winemaking — definitely of the “just let the grapes do their own thing” bent. We also spent some time discussing the massive amount of change a wine can go through while bottle-aging, even moreso than in barrel-aging in his view. Another excellent stop in downtown Walla Walla was Sleight of Hand Cellars, just around the corner from Sapolil (the intersection of 2nd and Main is a wonderful area of winetasting, so much is located right there). Trey, the winemaker is a big music fan, so we spent as much time talking about music as we did about wine, but he certainly is making some tasty wines. The Magician, his gewurztraminer is nicely dry with a good crisp acidity and excellent fruit and floral notes. I was really impressed by the dry cab franc rose (The Magician’s Assistant). Bone dry. Very nice. Hard to find that in a rose. A hint of spiciness and some nice fruit really round out this wine. My last stop in the downtown area was Walla Walla Village Winery. It was another very laid back tasting room with a selection of four wines. Both the riesling and the merlot were nice examples of their varietals, but my favorites were definitely the last two. The cabernet franc had an excellent balance of spicy pepper and rich fruit. The Bordello Red Bordeaux-style blend (guess what the building they’re in used to be) was very hearty and full and also nicely balanced. Definitely a great food wine.